Shelf is an award winning contact center and help desk knowledge management platform with advanced AI and the best search in the industry. Used by organizations like Google, Amazon and Nielson, Shelf was designed by a Harvard knowledge management expert and data scientist for best in class search and organization. Unlike other knowledgebase platforms, Shelf offers pinpoint accurate document search, AI automation for maintenance and powerful analytics. Contact us to speak with a consultant. Pros: Shelf is really easy to set up and get going very quickly and is incredibly intuitive to use. Its a great tool not only for managing knowledge inputs in a wide variety of formats but also for group and task based working. The web clipper is great for capturing information on the go and actually a lot of fun to use. The file permissions system is super efficient for setting up and breaking down work/interest groups. It ensures everyone gets what they need to know and gets a chance to appropriately share and contribute. Its strongly supportive of the informational needs of the multi layered management structure of the organization as well as for disseminating information and updates to its general membership and stakeholders. Cons: Although its already integrated with the three most important cloud storage sites and we hear more are on the way, we've already become firm Shelf fans and will continue to use so we'd like to see some fast-tracking so more become available sooner than later. We also hear email integration is on the way. Right now and until it comes, it would be useful for user email lists to be generated internally. Overall: Using Shelf in support of my consultancy/advisory tasks related to the development of an incubator hub in Belgrade, Serbia. Tasks require a lot of information coming in and out and disseminated to a wide variety of management, staff and stakeholders. We have been extremely glad to get our hands on the program. Not only does it support our organizational ethos of trying out new information technologies whenever we can and as they become available, its also been ideally suited and fit for our purpose. Its really smoothed and integrated our workflows and was just what we were looking for. Recommendations to other buyers: Give it ago. It was immediately obvious to us that Shelf has endless utility and can produce a best fit with a huge amount of user cases. It certainly did with ours and has quickly become integral to what we do. Its really glued together our workflows. I've no doubt it will do the same for any organization. The thing I like about it the most is that it does exactly what it says on the tin. If you're looking for a practical no nonsense tool that manages your informational inputs and integrates them with your your organizational structure and work outputs then look no further. Pros: This software is incredibly user friendly and I have really appreciated the ability to create separate libraries for all of the different stakeholders in my organization. It makes the navigation of the resource super intuitive for my staff and allows everyone to put their hands on what they need exactly when they need it. The ability to store and share a multitude of different file types as resources has also been invaluable. Cons: There is not much I don't like about the software but one update that I am eagerly anticipating is the ability to upload and have a master copy of a resource in my organization library and have it replicated in other libraries. This will cut down on the amount of uploads and also allow us to have stronger version control on resources that we use across the organization and across our different regions. Overall: My overall experience with SHELF has been incredibly positive. First and foremost the customer service and personal attention has been wonderful. I never go more than a few hours without answers to my questions and they are always ready to listen and work on any issues I am having no matter how minor. I really feel like they take their clients wants and needs into account as they develop updates and the response that I have gotten from my own organization has been overwhelmingly positive. Pros: Having a "Google like" (search by tags) generated system of classifying and organizing online/offline content onto one cloud platform is transformational. By allowing the end user (in our case, customers) to search via tags, then find>view>download any and all content relating to our relationship with them, the overall 'findability' and value of our resources increases expotentially. 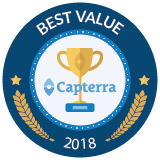 The value increases because it's not just sitting in some obscure Dropbox, it's growing and being harvested in "our walled garden" by our customers. For genre specific content, we can upload new content, tag with appropriate genre related tags and automatically 'push out' the material. Soon as the tags are applied, then all members of that genre have access to the material AND are automatically notified. Versus the old method of copy>paste individual files into each customer's Dropbox folder. The thumbnail display, which is truly amazing, provides a visual reference to the items searched for and shortens the final mile of the search to the speed of light. Tagging is an art and Shelf customer onboarding walks you through the learning curve (changing from the file folder based system). Cons: Still working on versioning, but the workaround works for us. Overall: We were searching for a archiving solution that would package our company's offline and online resources (designs, documents, ideas, etc.) into a value add, easy to find, easy to use tool for our customers. Shelf provided the exact solution. Similar to how Google provides valuable search options, Shelf give us (the originator) a way to package resources and then offer in a secure walled off 'garden' , so our customers can 'harvest' those resources. User Friendly with Great Features and Functionality! Pros: The top 3 features of Shelf for CMDW, Inc include Sync, Search and Sharing. 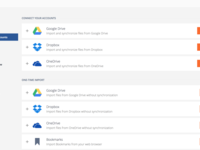 Shelf syncs with Google Drive and Dropbox to help users better organize and access files. Once files are synced, users can search for files via keyword(s) - even if you don't remember the title or when it was created. It's quick and easy to drag and drop files or folders to an updated private or shared folder from there (or simply leave in the current folders, as Shelf retains the original filing properties/locations during sync). Shelf is already setup with four permission levels - along with a "groups" feature to making sharing at specific access levels a breeze. I should also point out that Shelf works well with all types of files and media, including documents, audio, video and more - which is especially important for the creatives on our team! There are plenty of organization and collaboration tools out there - I've tried several, but Shelf has hit the UX (user experience) nail on the head. It's visually appealing and less intimidating for my clients and team members who are less tech savvy. The onboarding process for me was actually pretty fun. The demo was informative and tailored to my unique organizational needs. Customer rep really listened to my challenges and showed me how Shelf can solve many of our current problems. I'm really excited to finally have a functional solution for file management. No more lost hours searching and starting over from scratch! Pros: Personally, i love using Confluence but it was difficult to get our company onboard. We needed a product that was more flexible and easier to organize for our company's internal knowledgebase. 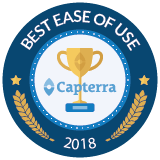 After a pretty extensive vetting process we selected Shelf because it allowed our team to continue using Dropbox, Drive and Slack while giving us the ability to manage our most critical docs in a centralized place. The features that make shelf unique are it's dropbox and Drive syncing, advanced search and filtered search capabilities, the ability to add additional meta data like tags and badges and the web clipper which enables our team to also use Shelf to capture youtube videos and web articles for training purposes. Cons: No product that tries to address knowledge management issues is going to be perfect.. Even knowledge managers at our firm have trouble keeping track of information across teams and departments so no solution is going to be a one size fits all. I prefer a wiki method of building knowledge bases and Shelf doesn't yet offer this feature but overall we're very happy with Shelf. Being able to link websites / videos / pdfs / documentation easily with a plugin. Feedback ability for each addition. Overall: I have been impressed with the ease and simplicity of the product. Our team transitioned pretty fast and adopted Shelf as a primary source for documentation. The support / sales team were very helpful and responsive when it came to any questions that I had. We really like the product and foresee it having a long life with us. Thanks for the feedback, including your comments on Version Control. Good news - we've recently released a Versioning feature into the product that allows senior user roles to view changes to a file and roll back to prior iterations, as needed. This eliminates the need to upload multiple versions. Have a look and let us know what you think! Comments: Shelf''s uploading, indexing, and search abilities are the smoothest and most intuitive I have encountered -even among content mining tools. Creating a Gem to contain all of the information I have found on a particular subject or for a specific project enables me to quickly find and access it at any time. No longer must I copy and paste news articles into Word documents and save them. Instead, I simply select Shelf's "Capture Article" function, and it does all the work for me. Then I can tag it with keywords, take notes, and highlight text only to be able to search through my notes on files too. My greatest complaint is the lack of a RStudio package integrating the two. This would allow me to seamlessly create Gems to use in all of my research projects. Even so, Shelf still allows me to use my collection of articles, videos, and other forms of data to far more easily complete my research projects than before i started using it. The International Peace and Security Institute (IPSI) uses Shelf to write literature reviews and for other research purposes. But it proves to be invaluable when crafting our experiential training programs. Instead of attempting to coordinate each member of our team's separate projects and research. Shelf indexes our cloud storage so that we can easily find anything other team members have done. Not only does Shelf sort through each team member's files so we can make better use of our time, but it also enables us to take notes on others' files. With IPSI's recent move to OneDrive, Colin Kennedy and the rest of Shelf's staff have supported us every step of the way to ensure we were as prepared as possible for a swift integration of OneDrive and Shelf. Their excellent customer support, thoughtfulness, and high quality product guarantee IPSI will be using Shelf for all of our file categorization and collaborative needs. Cons: There is no built in CRM tool, and this would be really useful t have accessible. Would also be great if this would integrate with Outlook. Takes some time to put the content you want on the platform but well worth it once it is set up and ready to use. Pros: - Shelf is great for project research and managing advertising versions and sales collateral for our marketing team - Easy to organize various iterations and revisions with custom and company tags, badges, groups, organization library, folders, etc - A powerful search tool that keeps what the team needs within reach. 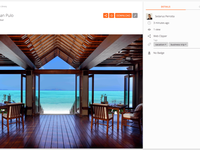 We can search inside documents & images and filter by version, date, users, content type and even different locations - Shelf has been an Evernote replacement for our team. It's a much easier and intuitive way for marketing and product teams to collaborate on content research. Cons: Cons; would like to see an integration for Slack. Our team uses Slack and it would be helpful to be able to pull in our attachments and links into Shelf so we have a more comprehensive experience. User-friendly with professional - and quick - support to help navigate any challenges. Pros: We're an international organization, and needed a platform that would be affordable and accessible globally. The staff at Shelf.io are incredibly customer-oriented and constantly seeking feedback to add new features and upgrade the system. The library is intuitive to use from both an administrator's and user's perspective. The search function is robust, making it easy to find relevant resources. And, the ability to have specific user-groups for certain documents is a huge benefit for us. Without question, an amazing resource for the price. Cons: I do wish we could customize the look (e.g., co-brand with logos, colors, etc.) - but really, if my only major complaint has to with aesthetics, the product certainly is working for us. Overall: Ability to easily - and securely - share resources with our global movement. Great experience, friendly, knowledgeable, no sales pressure which was AWESOME and APPRECIATED! Pros: We like the ease of sharing files and different resources across our membership. The ease of adding both internal content via OneDrive and external content with their Web Clipper is not found on any other product. Having the ability to customize user groups with specific roles in their group is a great feature. Allows us to promote people to roles in a group but not on the overall platform. The ability to make certain things public and certain things private allows for easy sharing and linking from website and social media. 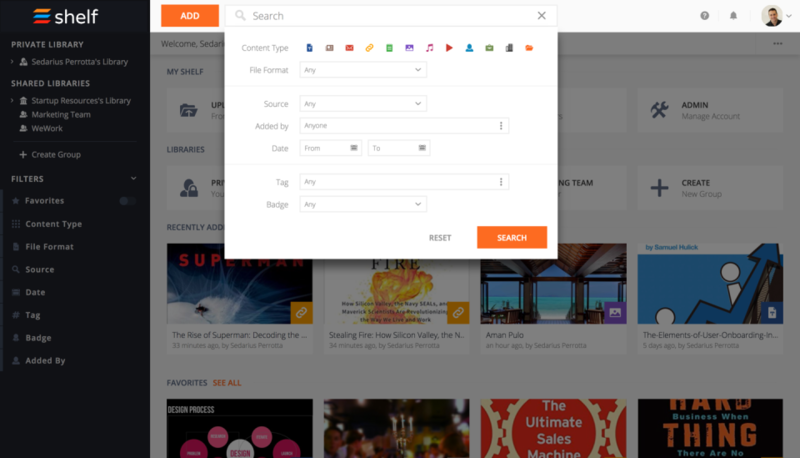 The search feature is the most impressive feature, allowing users to search from a wide variety of content across the entire platform. Don't forget about the ability for authors to get emails alerting for new comments to easily respond and address certain questions. Cons: The lack of a built in CRM tool and/or linking via api keeps the product from certain users but is the best CMS on the market. Overall: Easy CMS for users with NO TECH experience. Deepens our value to our members by providing not just our content but valued content from external sources in 1 easy to find, easy to search, and easy to share online platform. Pros: From adoption the platform was noticeably very clean and unique in terms of design and I felt like I had a direction immediately. Many other tech apps are stressful to adopt and you are never quite sure you are utilizing the most important features. Not only was it easy for me to figure out, but getting my relatively small team on my Shelf was just as easy. We created our own folder structure to suit our needs and organization preferences and everything has been smooth and I can find everything I upload very easily, especially when I know who uploaded it. Cons: I wish we can collaborate on documents inside of Shelf, but there really is not much a problem because they integrate with Google Drive directly so we can just upload it after. Shelf has been helping us avoid some costly mistakes. Pros: Shelf makes it easy for us to capture content using the web clipper and then forget about it until we need it again. The search features make it easy to locate stuff without knowing the name or the exact folder location. They have tags, a tag library and customized badges. Cons: I wish the web clipper enabled us to capture slideshare presentations and podcasts. I wrote to their customer service team and they said that it was in the works. - Foreign texts (Korean) are broke in Word files, while they look perfectly fine on PDF files. Overall: Our organization is using it as an information library. Storing, sharing, and searching information became so much easier with Shelf. Keep it up and hope continuous improvements are implicated. Vice President Of Business Development, U.S.
Pros: Shelf lets me put everything in one place and synchronize with other apps like Dropbox. It has a slick interface and was easy to learn. It's nice that I have both private areas and areas that I can share with an organization. I like how the tags work. Cons: I haven't really found any big downsides with Shelf. My main online storage areas are Dropbox and Google Drive and those are covered. It does take a little playing with Shelf to understand how to maximize its benefits, but there is good customer support available. My questions were answered quickly. 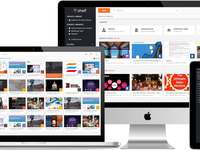 Pros: Shelf offers the unique ability to combine a great variety of digital content from a diversity of places into one central, organized, and searchable location. This, coupled with an in-depth training and onboarding process, as well as thoughtful constraints within the platform, assist the user not only with building but also maintaining an orderly and useful digital library. Cons: Shelf satisfies all of my major needs, but I do hope for future improvements in the areas of a) more advanced search features, b) finer-grained permissions options, c) more advanced tagging features, and d) custom fields and filters. Overall: Support team has been a genuine pleasure to work with. I have appreciated their helpfulness and care from initial contact, through the sales process, and now as a customer of several months. They are responsive to my requests and go out of their way to assist as needed, all while they continue to improve the product month by month. Pros: High level organizational capabilities, easy to use & attractive interface, the Web Clipper. The organizational capabilities are great (especially if you implement your company's existing file structure), but the search feature is so fine-tuned that you don't need to be overly organized to find what you need. Cons: There's no built in messaging or chat feature but they told me that a Slack integration was coming in the future. Pros: Just like its integrations with other productivity tools such as GSuite, Gmail, Dropbox, Evernote, and others, Shelf integrates with your workflow seamlessly. Being organized with regard to digital content creates new opportunities for work, collaboration, and productivity, while also reducing stress and frustration that wasn't as visible before using Shelf. Pros: We use Shelf as our knowledge base and onboarding tool for IT employees. We like how easy it is to organize different media (text, links to online articles, uploaded files, audio files, image files, video files, etc) into groups and folders. It integrates well into our existing systems and serves as our main focal point for organization. My content team has come to live by Shelf. Pros: Given the expanse of the internet, Shelf is a necessary tool for keeping track of research. Shelf saves us hours by keeping us from backtracking, shuffling links and losing "that one great thing I read somewhere." Apart from storage and organization, Shelf's advanced OCR features help us process giant documents so we can find the perfect section without reading endless pages. As we build our library of material, Shelf is replacing Google as my first place to look for data. Pros: The easy-to-use organizational structure and web clipper are both superb for curating, organizing and tagging information items into digital libraries. 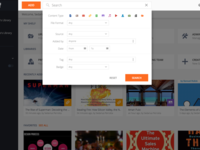 OCR enabled search within all digital media including web content, documents, images, videos, presentations, media types and tags provides our users with fast and actionable views of even vast volumes of content. Cons: I wish they had created Shelf sooner. There are very few collaborative taxonomy programs available and even fewer with the features and functionalities of Shelf. Overall: We use Shelf with our Center of Emphasis service. Pros: It is easy to use and being able to store and share any format of data is very convenient. Cons: The email addresses of other members are not stored, so when you want to share information, you need to know the address of that person (or copy and paste it from your email). Overall: It was a wonderful experience implementing Shelf. The project won the Partnership and Collaboration Award 2018 with Ontario's Economic Development Council. Excellent user experience for an unfinished product. I look forward to seeing future updates. Pros: It has a very visually aesthetic interface and allows you to add most content from the web to your own personal library. Cons: It's very limited in functionality once you've saved content. There isn't anything to do except search for it. I have been informed that the developers will be adding such functionality in the future though! Overall: Allows me to organise the massive amount of web content that I consume on a daily basis so that I can find it again. Pros: Being able to search by multiple functions, like file type, keywords and date. Sometimes I know I have something, but can't remember what it was called or where or when I stored it. Shelf solves that problem. Cons: I wish they had more integrations, I want to use it with everything. Overall: This is such a great product! An absolutely brilliant idea that has completely streamlined my work processes and save me time every day. Pros: Definitely the most user-friendly knowledge management tool out there. Good for cross-team collaboration. UX is clean, attractive, and intuitive. It doesn't take much time with the software to be able to effectively and easily use it. Cons: Would be great if there was a bulk tagging feature, that is probably only one of my main complaints. Pros: Easy to use - the web clipper revolutionizes how to quickly add web content and share with team members. Cons: Lack of a rating system is pretty unfortunate. Although I think that's coming in the future. Overall: Not only are we pleased with how shelf.io functions (so much so that we have made it our entire practice's document repository), but Colin's AMAZING customer service gives us confidence that we will be supported using shelf if/when anything comes up. If you're looking for a easy to use, effective content repository, this is by far the way to go! Thanks guys! A design so intuitive that they anticipate customer's needs before they need them. Superior customer interaction that goes beyond just support. Customizable to be tailor fit. Cons: The standard badges that are an additional tag for materials so to highlight them for other users don't fit my organization and therefore need to be able to be created or edited. Please note that I already passed this suggested to Shelf io Management and they are already working on it. Overall: A single location that is accessible to my team to use and share material. Cons: What's not to like? At the moment, its doesn't seem like there are as many integrations are there could be! Pros: Nothing is more frustrating than a customer or a coworker needing something from you and not being able to give them that information. The problem only gets worse when there is a team spread through-out the world. Shelf fixes this. Cons: These days, a key thing for platforms is being able to integrate with other tools. Considering this is aimed at teams, an integration for Slack is still needed. Pros: The searchability is wonderful! You can search by keywords, tags, file format, date, etc. It makes it so easy to find exactly what is needed! It's clean and has an intuitive user interface. Saves everyone in the sales organization time because there is now no more searching the most up to date document of anything. Cons: It would be nice to be able to have the same document saved in the same place, but they have discussed that this is one of the features that they are currently working on building. Overall, great product! Great product and customer support! Pros: Ease of use. We created our own Knowledge Base internally and found that after we created the "how to" article, it was rarely revisited. With Shelf's powerful searching, we are able to quickly access the "how to" articles as we originally intended. Also, the web clipper is a ridiculously awesome tool. Cons: Currently integration with products like One Drive and Sharepoint do not exist. But, it is on the road map and currently being addressed. Comments: It's so frustrating to share a great website, informative blog post, or knowledge-packed YouTube video with co-workers, just to have it land in their inbox, never to be found again. And this would happen at least a few times per week. Finding Shelf and its Web Clipper was a life-saver. Now, I can grab valuable web content in just seconds and share it with my teammates so they can easily access it later on. 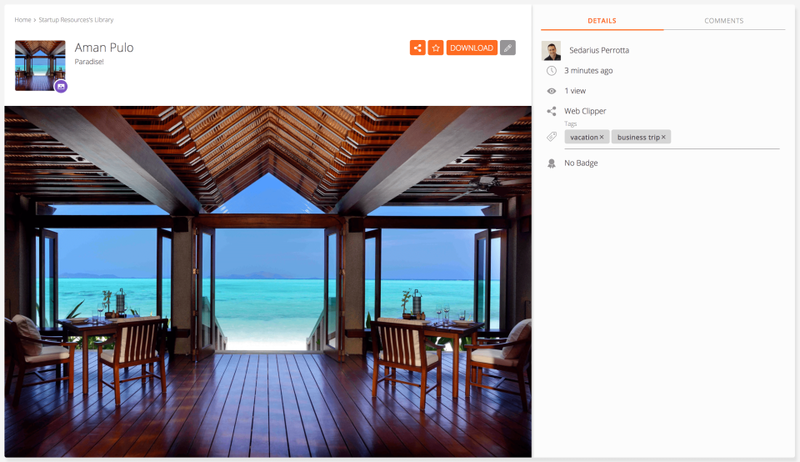 Great product if you are looking for a place to share content easily and quickly! Pros: The ability to quickly load and share content helped us get going quickly. It's a great tool for non-technical groups. Customer service is quick to respond. Cons: We had an issue with word count but Shelf was able to resolve this for us within a matter of minutes. Overall: We needed a place where we could collaborate and share internal and external information quickly and effectively. Shelf makes it easy to do so! I would highly recommend trying shelf out! 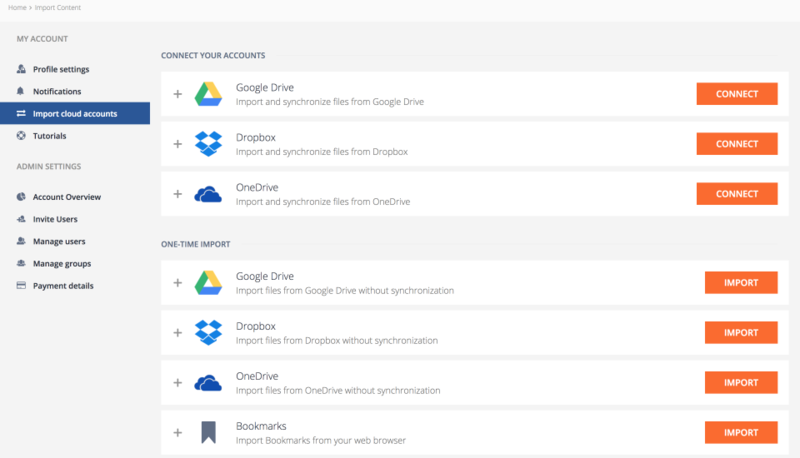 Dropbox, GDrive, OneDrive it's a mess - not anymore! Comments: I'm using different Cloud Storage Systems for different purposes - Customers, inside the Company, private. Therefore I lost the overview on a daily basis - what is where. With Shelf this days are gone. I just open Shelf, search for what I want and share it, download it or whatever. It is so efficient and convenient - I don't ever want to miss that again!! Comments: I came to shelf.io after searching for a service that would allow us to share some of our internal documents with others. I wanted there to be an easy filtering feature because Google Docs is a bit difficult in this department. Shelf.io is an amazing tool that allows you to upload basically any type of file. I would highly recommend! Pros: The search features , quick customer care responses and online tutorials. Cons: The speed and the sense that they were learning the functionalities of the product on the job. Overall: We wanted a product that would help us manage our knowledge better. The product is good , but the overall speed / refresh rate is poor in-spite of us using more than 50 mbps. Comments: We looked at a lot of places to host our Content Library for employees at Partners, and hands-down, Shelf was the best. Affordable, simple, straightforward, not trying to re-create a social network. Shelf does what it does, and does it great. Pros: UX is seamless, so easy to use and really well thought add. They are constantly adding new features which is great. Cons: Nothing really, I think setting up/picking any DAM tool can be a pain but thats not their issue, its just a big decision since migrating off of one onto another is very hard. A most have for your company. Comments: Shelf is an excellent platform. Simple to use, great search engine, great price, excellent customer service. Is just one of the best, you should try it. Pros: In absence of an overall document management strategy, Shelf.io is instrumental in locating documents stored on a variety of platforms. Saves gobs of time. Cons: Picky, but I dislike the color palette. On occasion, the soft gray and orange can be difficult to read. Comments: Fantastic stuff! Not sure what life was like before it and so incredibly easy to use. Would highly recommend for both personal and professional reasons. Comments: I love how easy it is to upload my content (videos, slide decks, audio files, etc.) and then be able to search them quickly for a particular term.